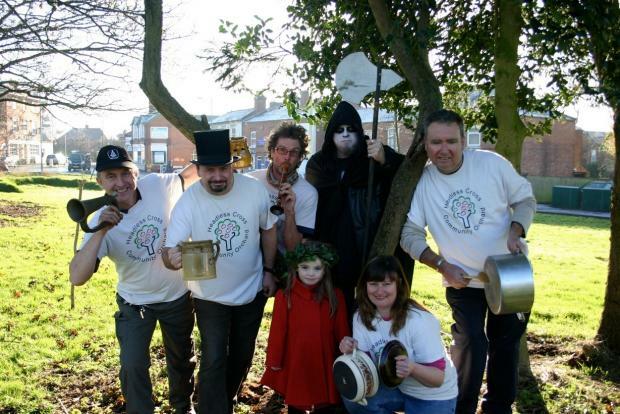 This piece was written for Worcestershire Life magazine’s website in January 2014, who asked for a short article on this urban wassail. Their site has since been revamped and no longer features older articles. For the benefit of anyone interested in this event, I’ve decided to host it here instead. Worcestershire has been blessed with perfect conditions for fruit crops, the most famous example being the Vale of Evesham where much of the UK’s fruit and vegetable produce is grown. Throughout the county, the familiar sight of blossom filled fruit trees lifts the spirits in springtime. The orchards provide their own unique eco-systems, and despite being a somewhat artificial environment, provide a haven for wild flowers and insects. In years past,orchards were very important to local economies. The annual fruit harvest brought a bounty in which was enjoyed throughout the year. Apple orchards gave the people the means to make cider, juice, and cider vinegar which can be used as a preserving aid, disinfectant and in medicine. Sadly, many of the counties orchards have fallen into decline in the last sixty years. Some of this is due to neglect or more popular varieties of fruit being imported from abroad, with another culprit being development and change of land use. Bucking the trend of this decline, individuals or groups up and down the county are replanting; hoping to raise interest and awareness of the fruit orchards, preserve local fruit varieties, and even provide a “green space” for the local community. 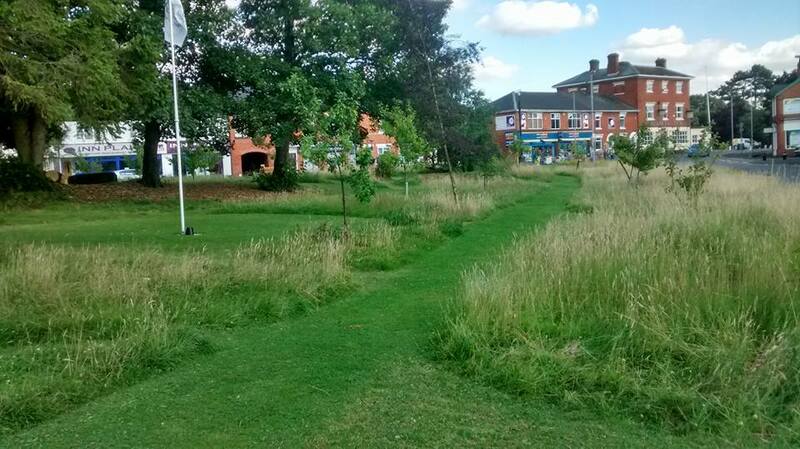 One such group is the Headless Cross Green Community Orchard. One of the more surprising places to find an orchard of apple and plum trees is in the busy town of Redditch. Yet, the Headless Cross Green Community Orchard volunteers have managed to create a rather magical space, and provide not only an oasis for wildlife, but an important community resource that will be enjoyed by future generations, which will only improve as the trees mature. Headless Cross Green used to be nothing more than a grassy area next to the car park for the local shops. In 2010, to provide a space for the community and prevent the land being sold for development, local volunteers cleared the area and planted local varieties of fruit trees such as the Doddin apple and Pershore Purple plum. Their hard work paid off, as the Green was awarded the status of Fields in Trust. This permanently safeguards outdoor recreational spaces through a Deed. Since that time, the Green has been used for many local events each year including a May fair, Apple Day at harvest time, and an Orchard Wassail. 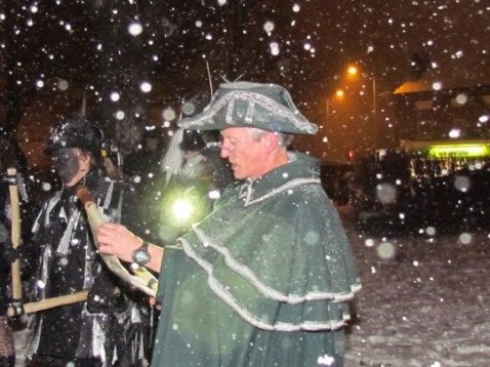 The first Orchard Wassail was held on a snowy evening in February 2012. 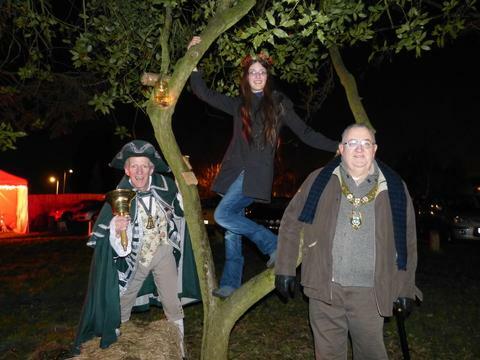 Bromsgrove’s Town Crier, the Aelfgythe Morris dancers, and local residents met on the green to Wassail the orchard. 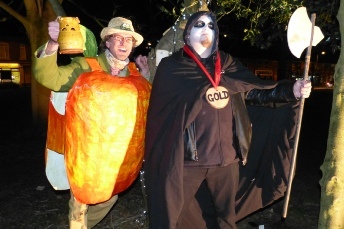 Each year since, the locals have gathered to carry out this historic tradition in order to help the orchard to thrive. But what are the origins of this festival? The first recorded mention was at Fordwich, Kent, in 1585, by which time groups of young men would go between orchards performing the rite for a reward. The word “wassail” is believed to derive from the Old Norse, “ves heil” and Old English “was hál”, literally meaning “be whole”. The term means “be in good health”, or “be fortunate”. It was first used as a simple greeting, then when the Danes started to settle in Britain in the Dark Ages it became a drinking formula. “Was Hail” became a widely adopted toast in feasting halls. Over time, a different sort of wassailing emerged. As well as toast the nobility or honoured among their society, farmers began to wassail their crops and animals to encourage fertility and boost the harvest. An anonymous record tells us that, “They go into the Ox-house to the oxen with the Wassell-bowle and drink to their health.” The practice continues in Britain today, whereby the trees are toasted to promote an abundant crop the next year. The cider used in the toast would be made from the apples harvested from the same orchard. Or, if an orchard was barren, it would be a practice that cider from a bountiful orchard would be “fed” to the trees, to encourage them. You can keep up to date with the Orchard’s events by following them on Facebook.